Renee Stone, Deputy Chief of Staff to U.S. Secretary of the Interior Ken Salazar; John Regan, now City Manager, City of St. Augustine; Dana Ste. Claire, Director of Historic Tourism ; Ken Salazar, Secretary of the U.S. Department of the Interior; Joseph Boles, Mayor of the City of St. Augustine; Bill Leary, now St. Augustine City Commissioner and former employee of the Department of the Interior; and Ray Rivera, Director of External and Intergovernmental Affairs for the U.S. Department of the Interior, photographed March 9, 2010. Monday, July 18, 2011, was a great day in the history of making St. Augustine a better place. At Flagler College Auditorium, Secretary of the Interior Kenneth Salazar came very close to endorsing a St. Augustine National Historical Park and National Seashore Monday at the inaugural meeting of the St. Augustine 450th Commemoration Commission, enacted thanks to the efforts of U.S. Rep. John Mica and Senator Bill Nelson. Congressman Mica lobbied hard for funds support for the Castillo San Marco Visitor Center. On the videotape of the 450th Commission meeting, Secretary Salazar can be heard referring to the “St. Augustine National Parks here” and praised the “leadership of Gordy Wilson,” longtime superintendent of Castillo de San Marcos National Monument and Fort Matanzas National Monument. Yes, St. Augustine currently has only two small national monuments – but we do need a St. Augustine National Historical Park and Seashore and Salazar’s remarks give us great hope for that goal. Secretary Salazar’s speech was ad lib – the Department of the Interior responded to me by E-mail yesterday that there was no prepared text. 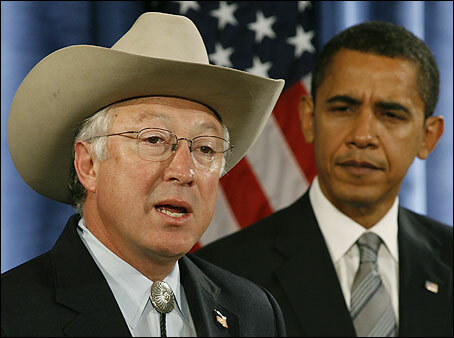 Again, Secretary Salazar referred to the “St. Augustine National Parks here,” telling us that the goal of a St. Augustine National Historical Park and Seashore is within our grasp. How do we get there? How do we get the park enacted? What do you reckon? Salazar’s speech suggests some answers. The Department of the Interior will work “hand in hand” with St. Augustine to celebrate a “national event.” St. Augustine is a “very special place,” Secretary Salazar said. In fact, St. Augustine, Florida is “one of our Creator’s most special places.” We agree. That is the premise of the St. Augustine National Historical Park and National Seashore Act of 2011. Secretary Salazar said the contributions of St. Augustine and Florida to our history need to be made “known to our Nation and are known to the world.” St. Augustine has “history that we carry in our hearts,” he said. We agree. Secretary Salazar talked about how much he loves his job and how he gets to “celebrate Yosemite, Acadia and the Everglades” in his job (as opposed to the Transportation Secretary, Ray LaHood, who gets to celebrate roads and bridges)(. “Never since the Great Depression has America lived in such an unsettled economy,” Salazar said. Salazar talked about how important the Everglades are to tourism and the economy, noting it is a World Heritage site. Could St. Augustine one day become a World Heritage site? Why not? Drawing affectionate and appreciative laughter from St. Augustine residents, Secretary Salazar told about how Director Eric P. Johnson of the Mission of Nombre de Dios and the Shrine of Our Lady of La Leche (the Catholic shrine) told him Sunday night about how young Eric Johnson corrected his teachers about Plymouth Rock and Jamestown when he was in school, telling them that they were not where America began. Likewise, Secretary Salazar said, to gentle laughter, that he was among the tens of millions of Americans who were falsely given the impression their ancestors came over on the Mayflower. This was despite the fact that Salazar grew up in a Hispanic community some 265 miles South of Denver. In Salazar’s household, everyone spoke Spanish – his family has been in America for eight generations, and his ancestors helped found Santa Fe, New Mexico. Secretary Salazar talked about the strong, inextricable, irrefragable link between economics, tourism and outdoor recreation. He spoke of working with 450th Commission Chairman Jay Kislak and other members of the National Parks Foundation to promote outdoor recreation and economic growth. Secretary Salazar kvelled that “Outdoor recreation alone creates 6.5 million jobs,” with some $700 billion added to the economy” from outdoor recreation. “As we struggle with the economic crisis of our time, we ought not to forget that we need to keep investing in the conservation agenda,” Salazar said. Salazar said he was “here in St. Augustine in large part due to the efforts of your Mayor,” Joseph Boles, who “came to my office,” saying he “would not be here today” but for Mayor Boles’ “advocacy along with the local leadership here” and Senator Bill Nelson. The Record barely reported what the Secretary of the Interior had to say. Then the Record was mum, and also did not report the fact that, when public questions were allowed, the audience applauded the request to make a presentation to the 450th Commission about the proposed St. Augustine National Historical Park and National Seashore.